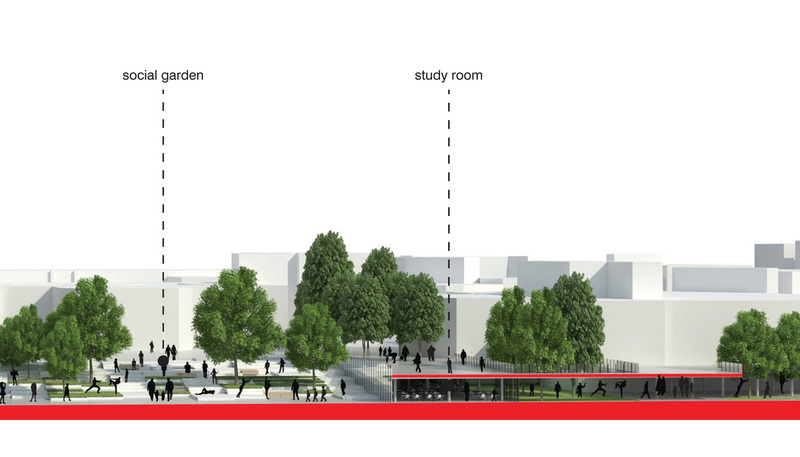 The campus is completely incorporated in the structure of the city, the expansion of the city has fully integrated the campus. 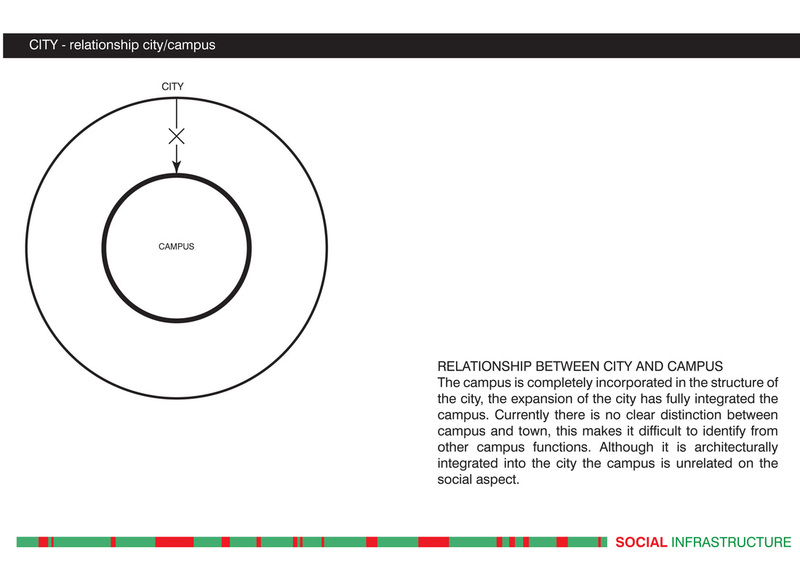 Currently there is no clear distinction between campus and town, this makes it difficult to identify from other campus functions. 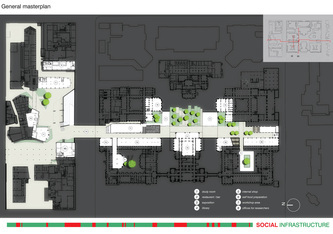 Although it is architecturally integrated into the city the campus is unrelated on the social aspect. The history of the campus construction has led to the creation of different faculties that are assembled next to each other. The creation in different time did not allow a global project to all the faculties that would guarantee an interconnection between them. 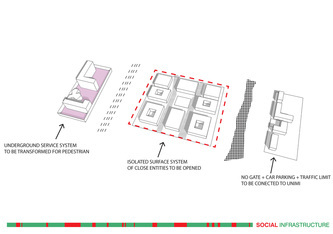 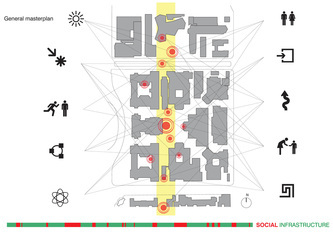 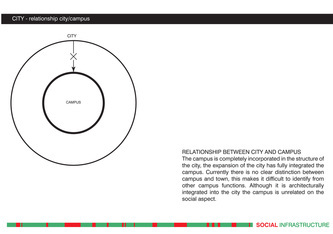 The heterogeneity of the system at the city campus studies led to a physical and social fragmentation. 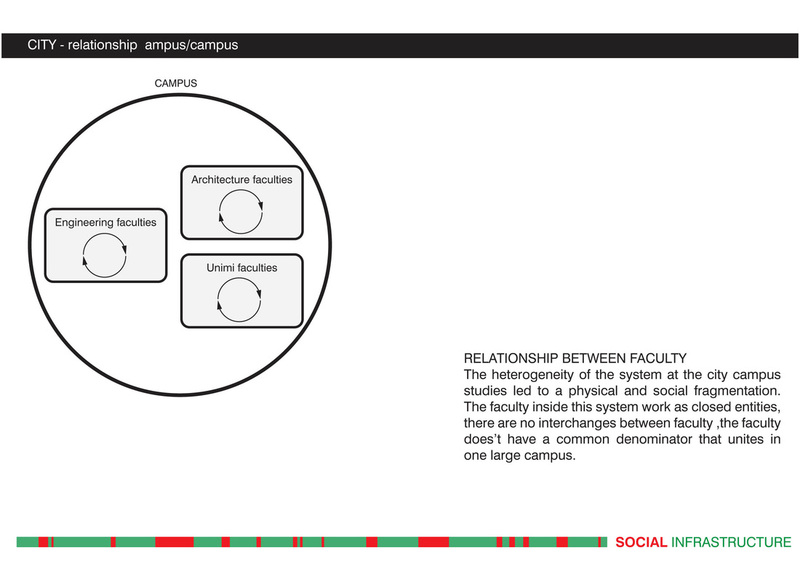 The faculty inside this system work as closed entities, there are no interchanges between faculty ,the faculty does’t have a common denominator that unites in one large campus. 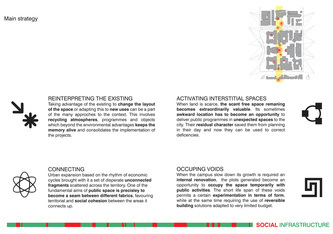 concentration and free time. 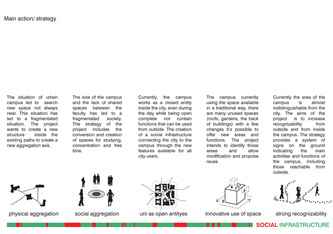 Currently, the campus works as a closed entity inside the city, even during the day while being open complete not contain functions that can be used from outside. 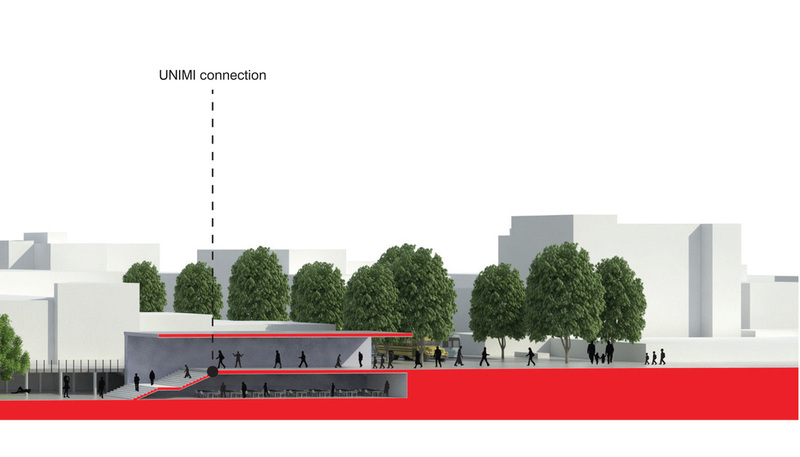 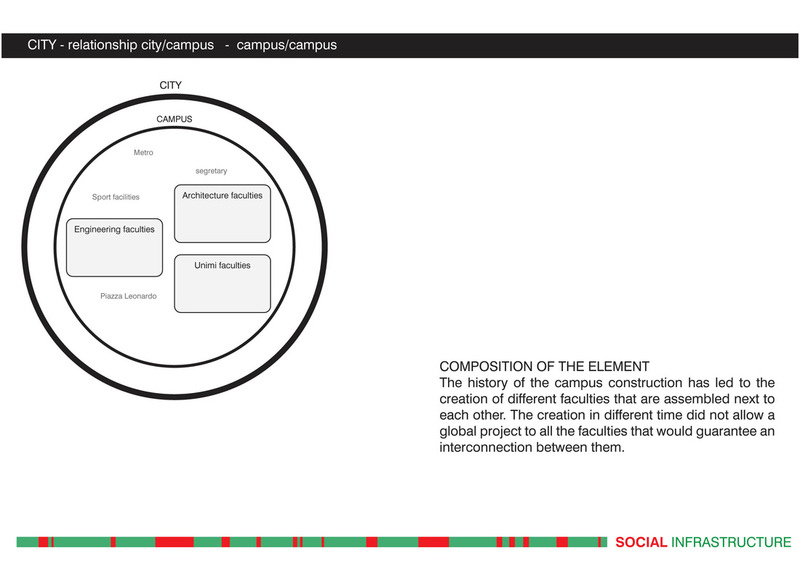 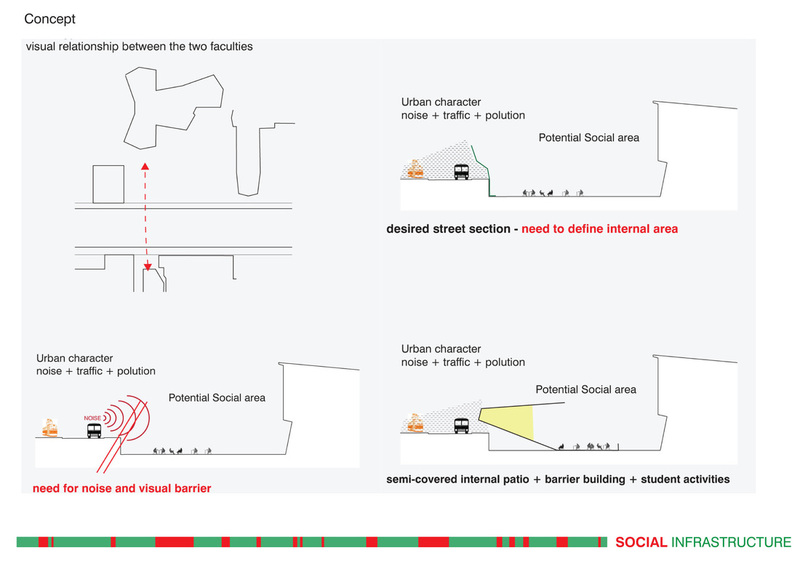 The creation of a social infrastructure connecting the city to thecampus through the new features available for all city users. 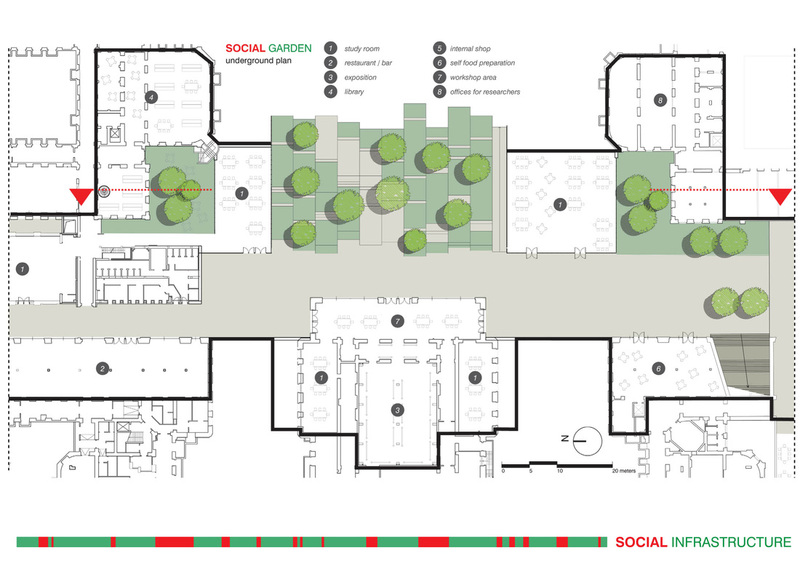 The campus currently using the space available in a traditional way, there are many unused spaces (roofs, gardens, the back of buildings) with a few changes it’s possible to offer new areas and functions. 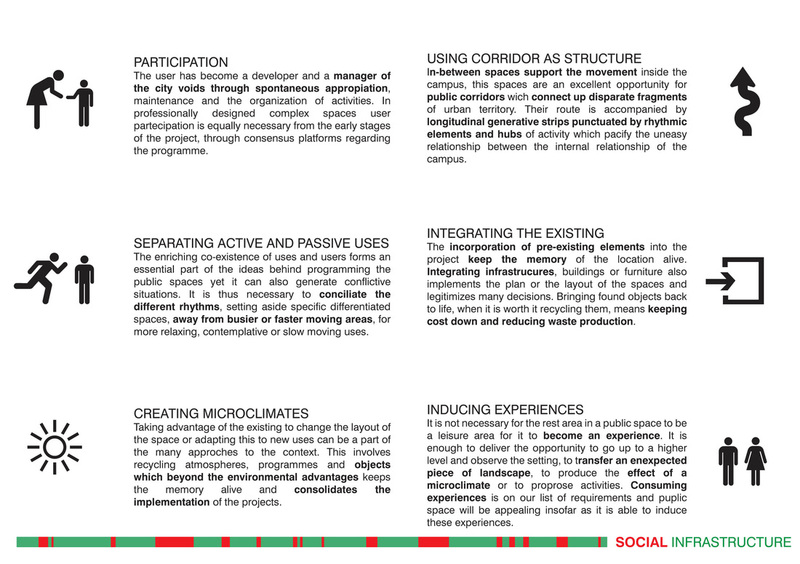 The project intends to identify those areas and allow modification and propose reuse. 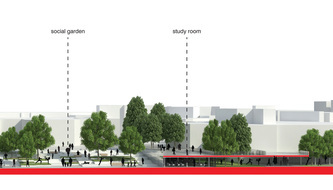 Currently the area of the campus is almost indistinguishable from the city. 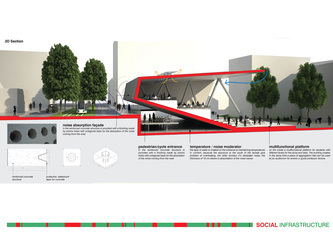 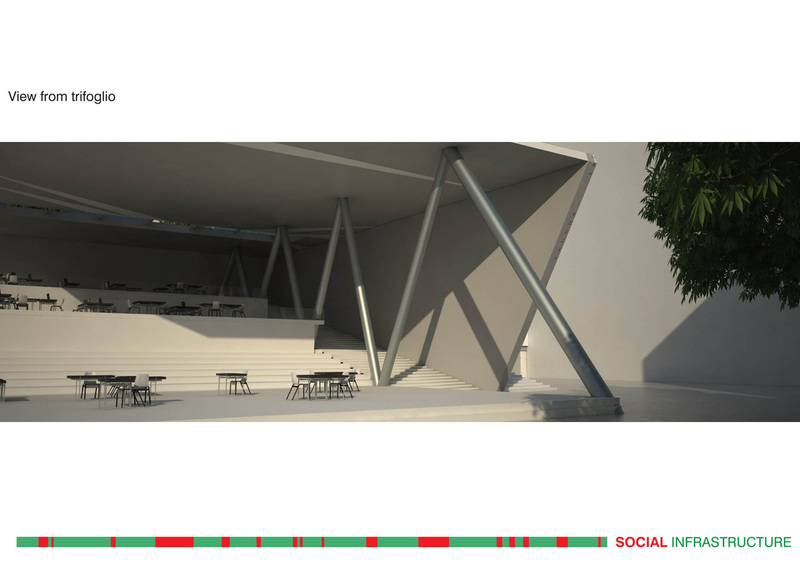 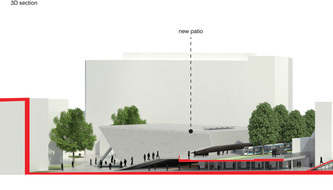 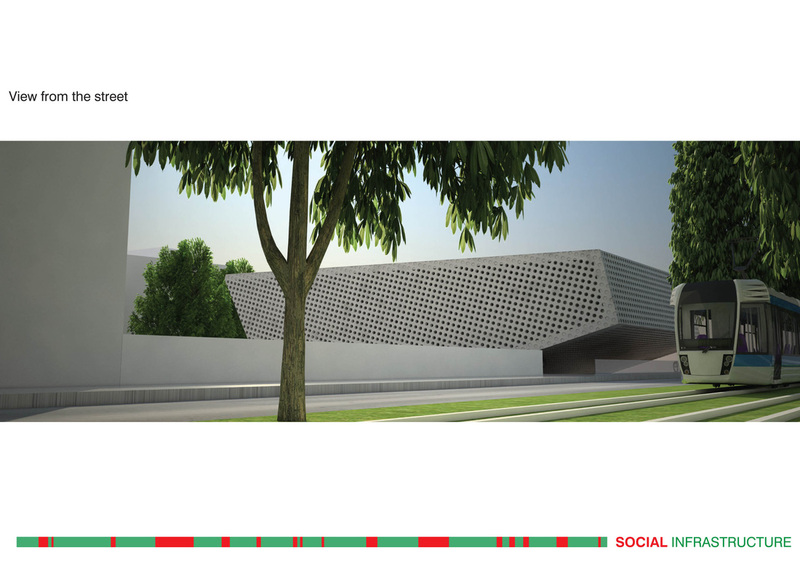 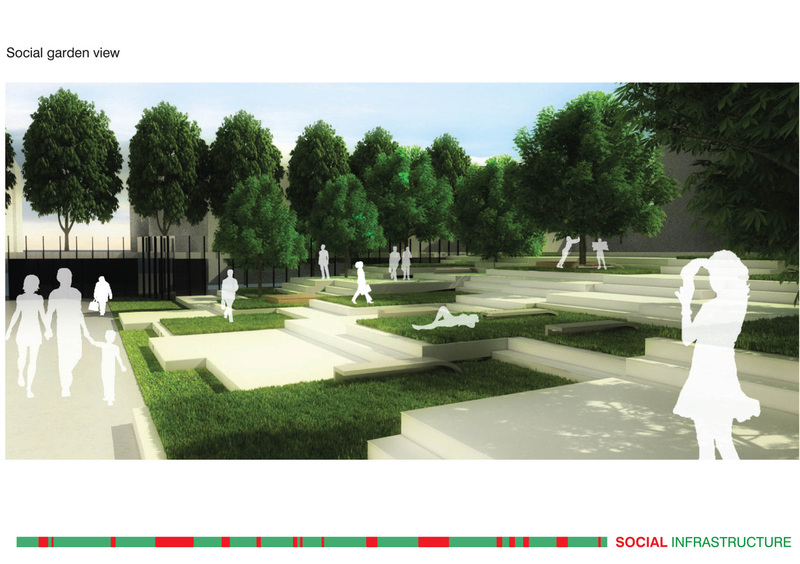 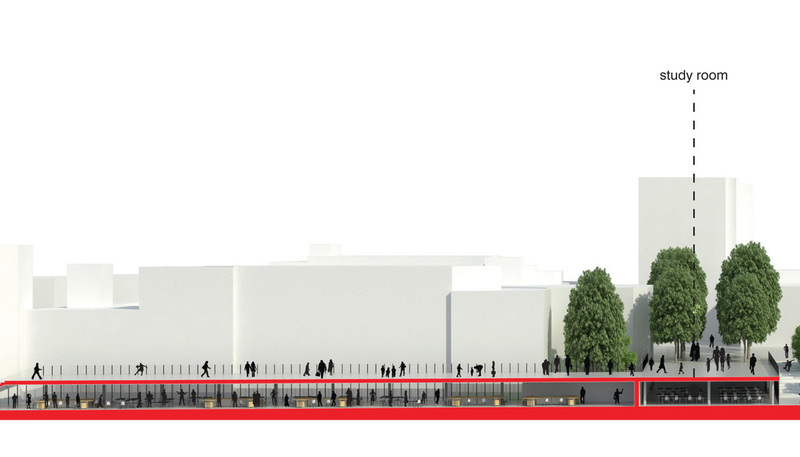 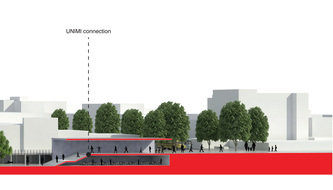 The aims of the project is to increase recognizability from outside and from inside the campus. 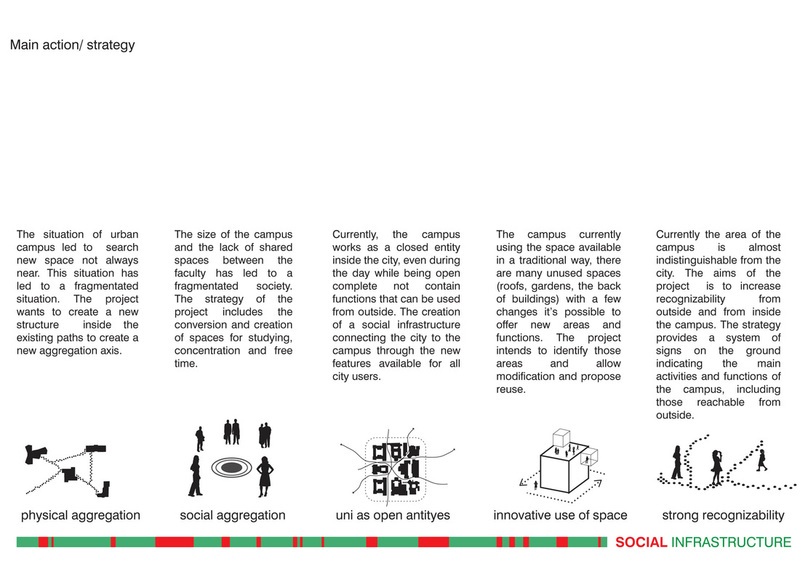 The strategy provides a system of signs on the ground indicating the main activities and functions of the campus, including those reachable from outside. 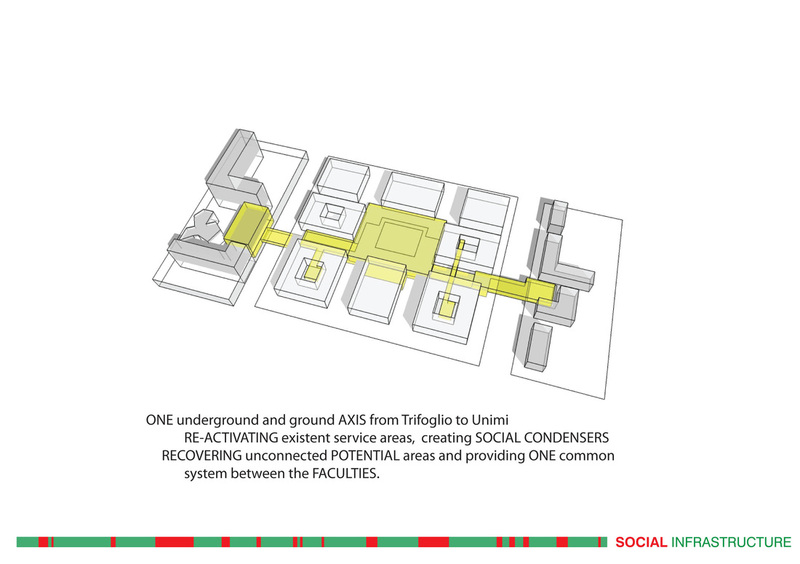  The project intervene on the creation of an new network between (architecture- engeneeringunimi faculties) and outside the campus (city). 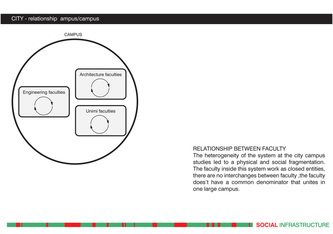 The system of connections links the major points of campus, creating a new relationship between the faculty and the city. 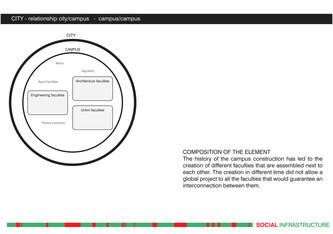 The system of connections links the major points of campus, creating a new relationship between the faculty and the city. 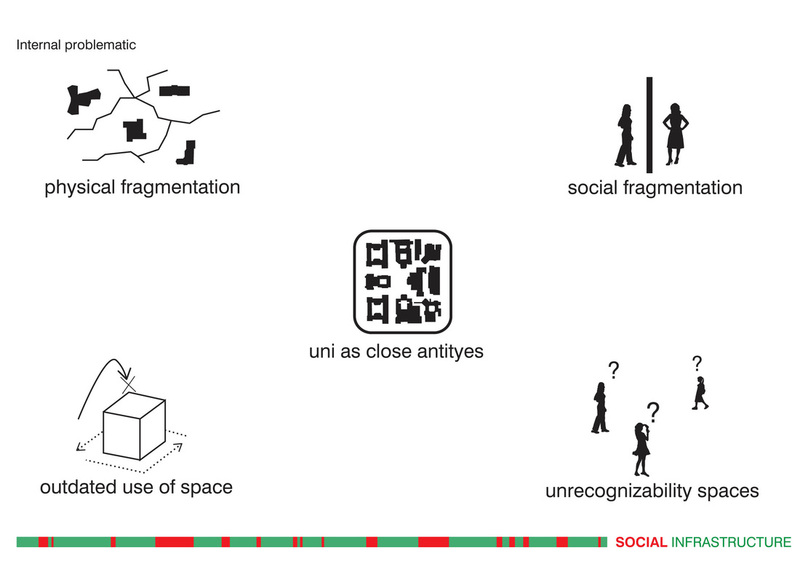 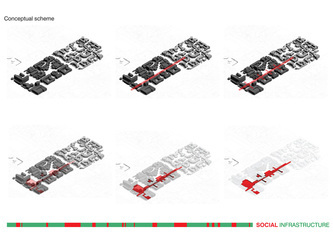 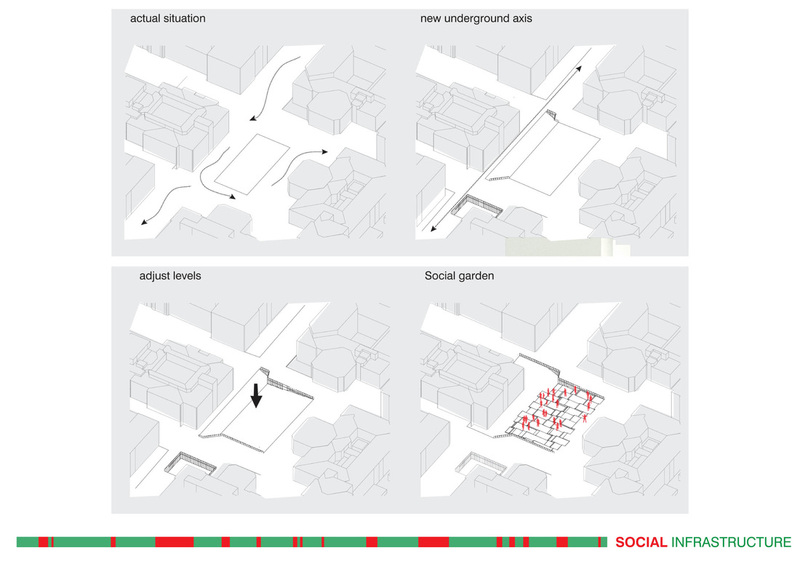 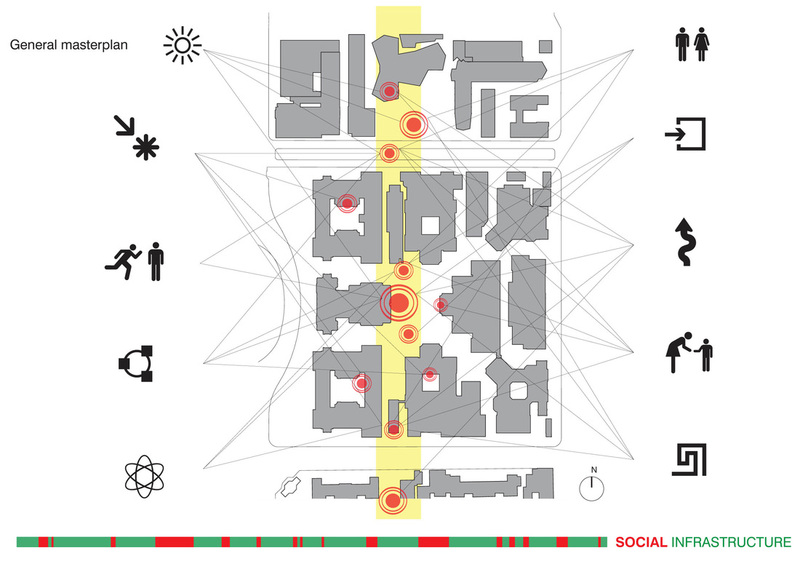 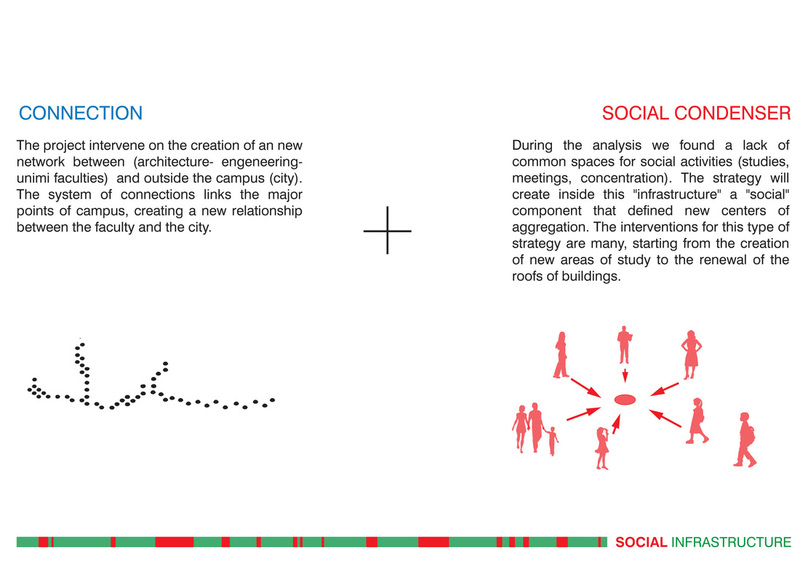 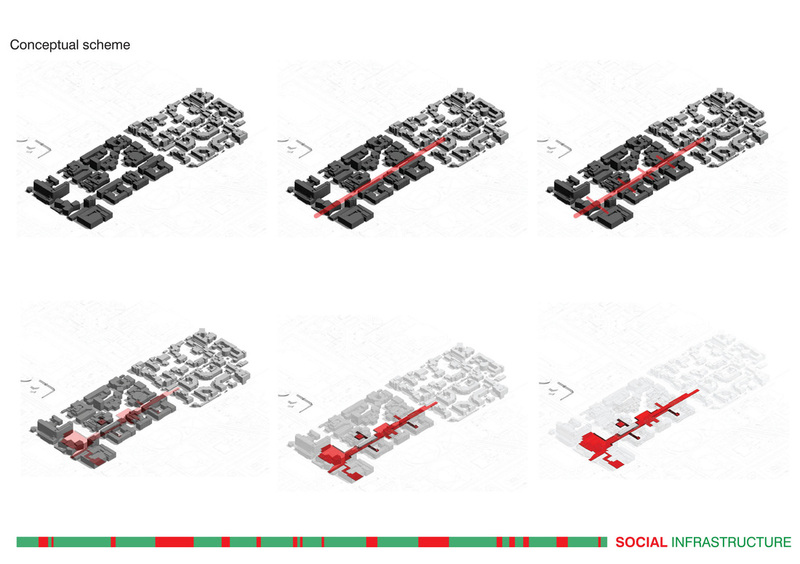 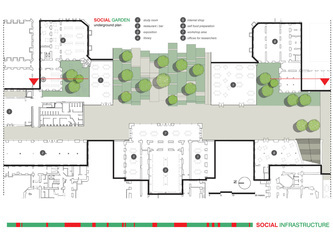 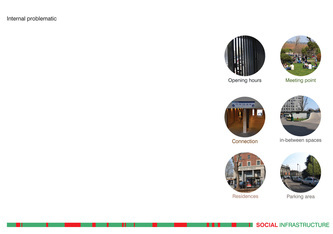 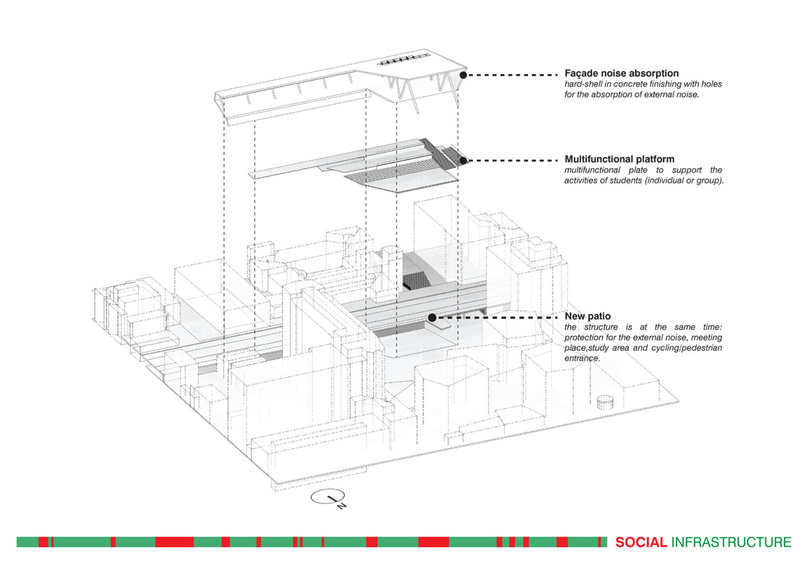 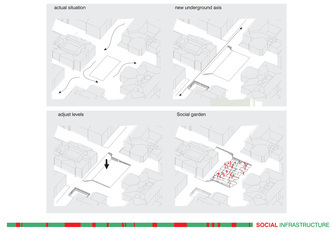 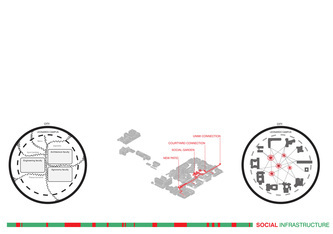 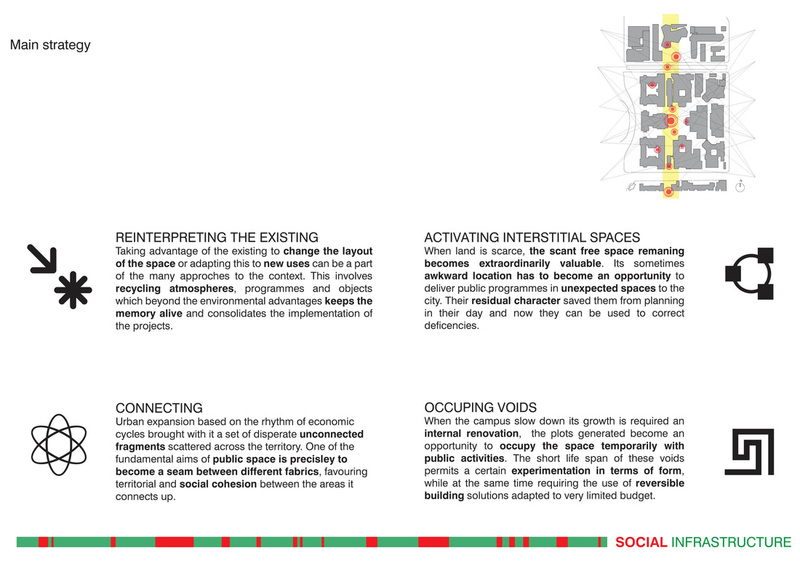 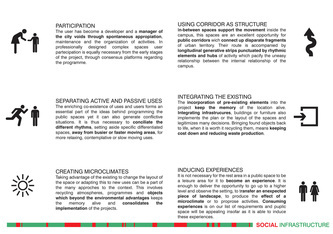 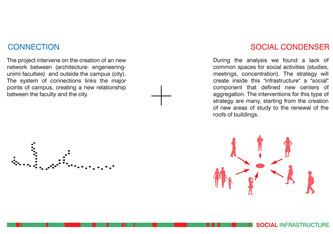 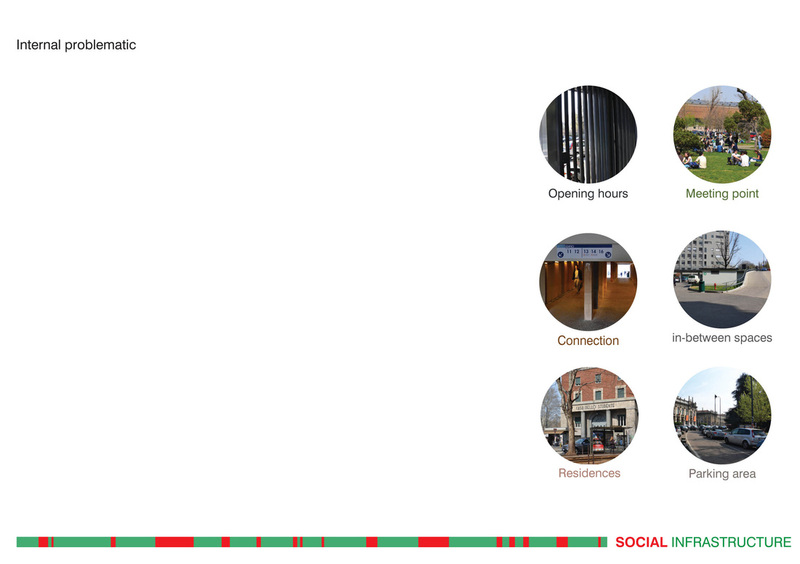 During the analysis we found a lack of common spaces for social activities (studies, meetings, concentration). 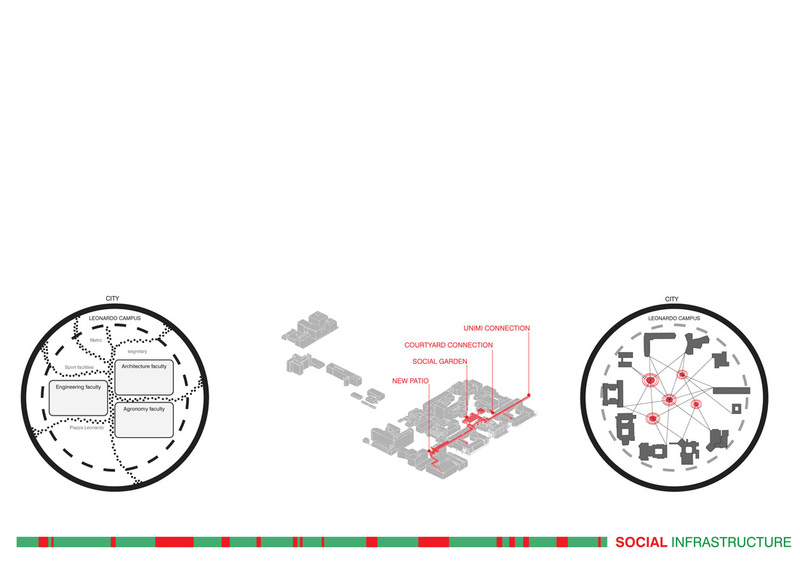 The strategy will create inside this "infrastructure" a "social" component that defined new centers of aggregation. 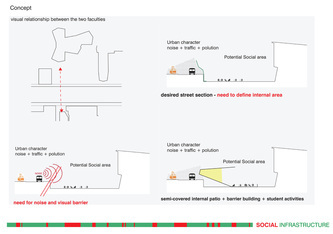 The interventions for this type of strategy are many, starting from the creation of new areas of study to the renewal of the roofs of buildings.